Former ANA President and Executive Director Edward C. Rochette, 90, died on January 18 in Colorado Springs, Colorado, where he lived most of his life. He was born on February 17, 1927, in Worcester, Massachusetts, to Edward Rochette, a physician, and Lilia A. (Viau) Rochette, both of whom died before Ed Jr. reached adulthood. Friends and family remember Rochette’s sparkling wit, creative spirit, astute mind, and strong ethical compass, which he relied upon to guide his life and family. He developed his love for numismatics as a youngster, when he reg­ularly searched the cash drawer at his grandfather’s diner for collectible coins. He served as an electrician in the U.S. Navy during World War II, and attended Clark University in Worcester and Washington University in St. Louis, Missouri. Rochette began his professional numismatic career as a cartoonist and editor for Numismatic News, printed in Iola, Wisconsin, by Krause Publications. Later, he served the company as executive editor. In 1966 Rochette left Iola to become editor of The Numismatist, the Association’s official journal. As editor, Ed had a front-row seat for the construction of the new ANA headquarters, which began on the Colorado College campus about the same time he (and later his family) moved to town. The March 1967 issue of The Numismatist was the first to roll off the presses under his leadership. He sat in the editor’s chair until 1972, when he was tapped to serve as ANA executive vice president. The Association prospered in its new home, but within 13 years it began to experience growing pains. Rochette was at the helm when a drive was launched in 1980 to finance a second-story addition that would expand the museum, library and staff offices. He shepherded the construction, keeping an eye on the progress and making sure all went according to plan. On June 10, 1982, he was on hand to welcome guests and dignitaries to the official dedication. 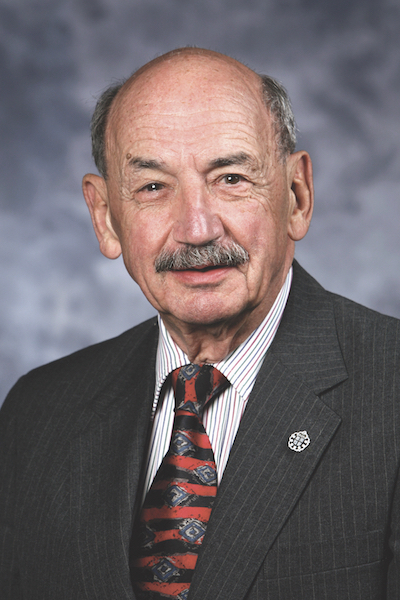 Rochette retired as executive vice president in 1986, and in 1987 was elected to the ANA Board of Governors, going on to serve as vice president in 1989-91 and president in 1991-93. In the years that followed, ANA museum and library visitation increased markedly, and the facility was sorely in need of a facelift. In 1998, Rochette was called out of retirement to serve as ANA executive director, and in 2000 he spearheaded and oversaw a second headquarters renovation. Rochette stepped down as executive director in July 2003. Thanks to a $500,000 contribution from an anonymous donor and his longtime friend, mentor and employer Chester Krause, the ANA Money Museum was renamed in his honor in 2005. Two years later, Rochette ran successfully for the ANA Board, serving a term as governor. Rochette was a prolific and popular author, penning the monthly “Other Side of the Coin” column for The Numismatist for two decades. He wrote a weekly coin column that was nationally syndicated by the Los Angeles Times, and contributed a monthly column to COINage. He published books on three favorite topics: Medallic Portraits of John F. Kennedy (1966), Making Money: Rogues and Rascals Who Made Their Own (1986) and The Romance of Coin Collecting (1991). In the late 1960s, Rochette collaborated with Lt. Col. Adna G. Wilde Jr., then ANA executive director, to introduce the week-long ANA Summer Seminar in Colorado Springs. He also was instrumental in developing a numismatic exhibit for the International Olympic Committee’s museum in Lausanne, Switz­erland, and served as a numismatic consultant to the U.S. Olympic Committee and the U.S. Air Force Academy. In 1987 he was general chairman of the 50th Anniversary Congress and Exhibition of the Fédération Internationale de la Médaille (FIDEM), a global organization of medallic artists. The event was hosted by the American Numismatic Association, marking the first time FIDEM had convened in the United States. Collaborative and congenial, Rochette made friends easily and cultivated relationships that benefited the ANA. In 1977, he secured a bequest from ANA life member Kenneth Keith that remains a key financial asset, securing the Association’s future. Rochette has received many ANA accolades, including the Medal of Merit (1972), Farran Zerbe Memorial Award for Distinguished Service (1987), Glenn Smedley Memorial Award (1993), Lifetime Achievement Award (1999), Burnett Anderson Memorial Award for Excellence in Numismatic Writing (2003, presented jointly by the ANA, American Numismatic Society and the Numismatic Literary Guild), and Numismatist of the Year (2003). He was the second recipient of the Numismatic Literary Guild’s prestigious Clemy Award (1969), and was named a Numismatic Ambassador by Numismatic News (1986). In 2000, he was inducted into the Numismatic Hall of Fame at the ANA’s Colorado Springs headquarters. Says author and ANA Past President Q. David Bowers, “Next to the Association’s founder George F. Heath, no one has done more for the ANA than Ed Rochette. Rochette is survived by his wife of 40 years, Mary Ann; three sons (Edward, Paul and Philip) by his first wife, Faye (who died in 1977); four stepchildren (Joseph, Michael, Paul and Susan); 14 grandchildren; and 7 great-grandchildren. Donations in his memory can be made to New Century Hospice, 6270 Lehman Dr., Suite 150, Colorado Springs, CO 80918.
organization dedicated to encouraging the study and collection of coins and related items. The ANA helps its 25,000 members and the public discover and explore the world of money through its array of instructional and outreach programs, as well as its museum, library, publications and conventions. For more information, call 719-632-2646 or visit www.money.org.